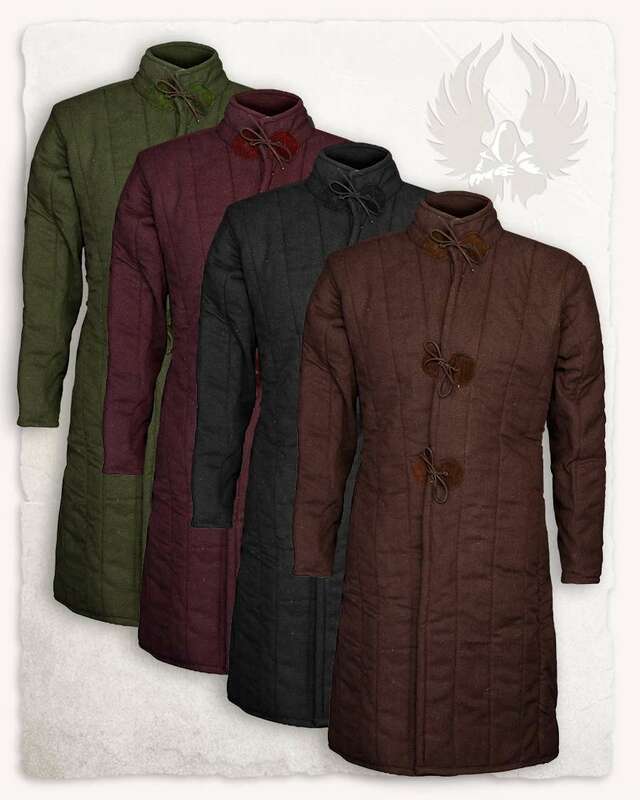 All Velvet Glove arming jackets and gambesons are designed to be worn underneath armour for your comfort. These items are suitable as armour for LRP combat. They are not suitable as stand alone armour for re-enactment. If used for re-enactment, they should only be used in conjunction with other forms of armour. New Gambesons are now available open fronted. These will be fastened with ties in the same manner as the arming jackets or buckles at an extra £4. Buckles will now allow the item to still be reversible due to a new design. Coming Soon - Leather All Arming Jackets or Gambesons on this page can be made with a suede leather outer. Prices coming soon. If you wish to purchase this item before it's added to the catalogue please contact us Canvas? All Arming Jackets or Gambesons on this page can be made in canvas for an extra £5. Canvas is only available in a cream colour. Colours Each Jacket/Gambeson is created from TWO colours of your choice and is fully reversible, so you effectively get two jackets in one! 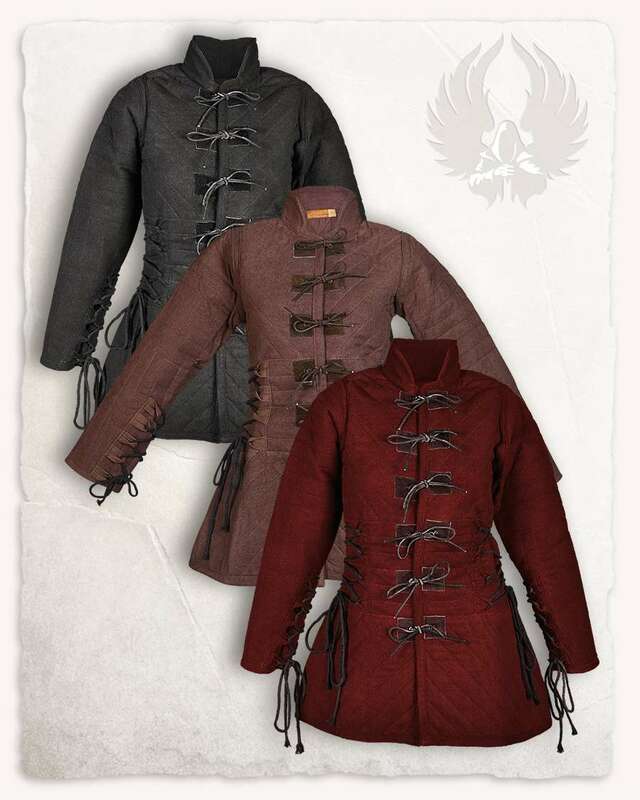 Don't forget when ordering to specify the colours you want your arming jacket / Gambeson in. 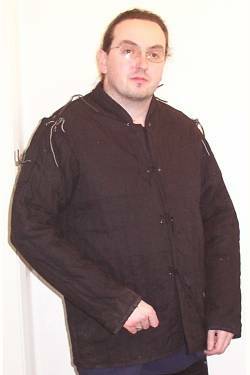 Fastenings Arming Jacket sleeves are fastened to the body by strong tied cord. 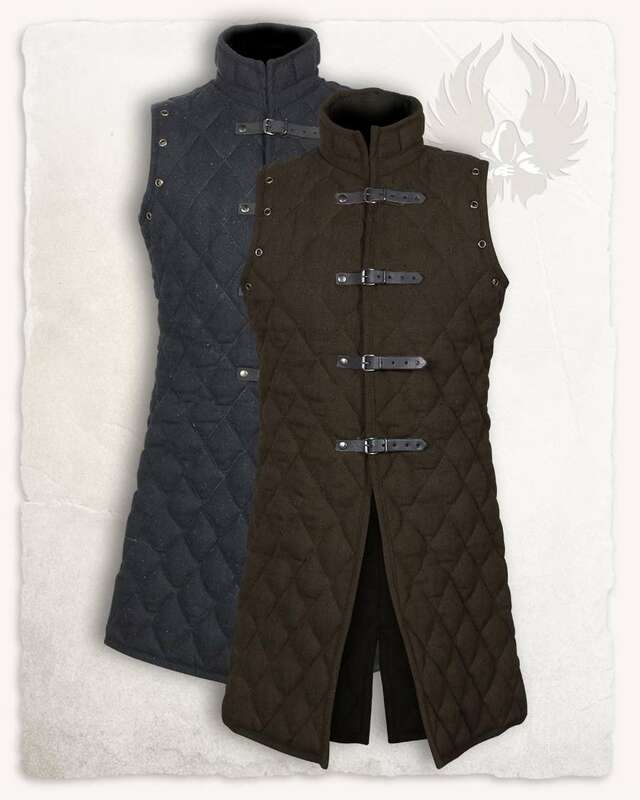 A column quilted arming jacket. Reversible and made in two colours of your choice. Often worn as an initial layer of armour, upon which metal plate armour can be mounted securely. The photo is long-sleeved with laced on sleeves and tied front. 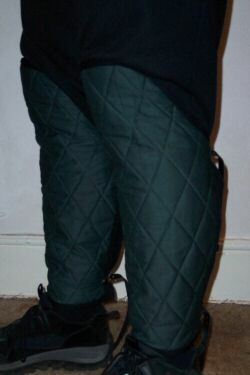 A diamond-pattern quilted gambeson. Reversible and made in two colours of your choice. Often worn as an initial layer of armour, upon which chainmail armour can be mounted securely. The photo is of the short-sleeved version. 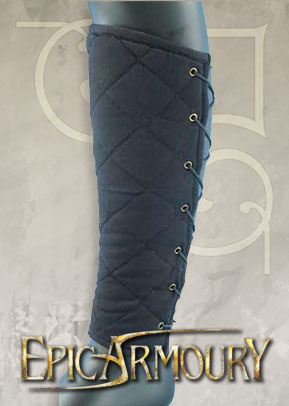 Reversible lower leg armour in the same style as the gambesons. These are buckle fastened. Studded version costs an extra £7. Reversible lower arm armour in the same style as the gambesons. Studded version costs an extra £7. Buckle fastenings are available for an extra £3. Ready for Battle Childs Padding. Basic Padded armour for the would be warrior. With its narrow diamond shaped stichings and light lining, it is ideal to be worn under armour without limiting the mobility of the wearer. 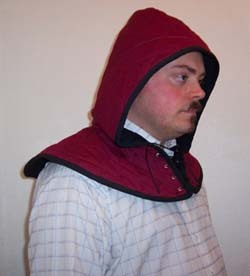 It also works excellently as an independent upper garment. 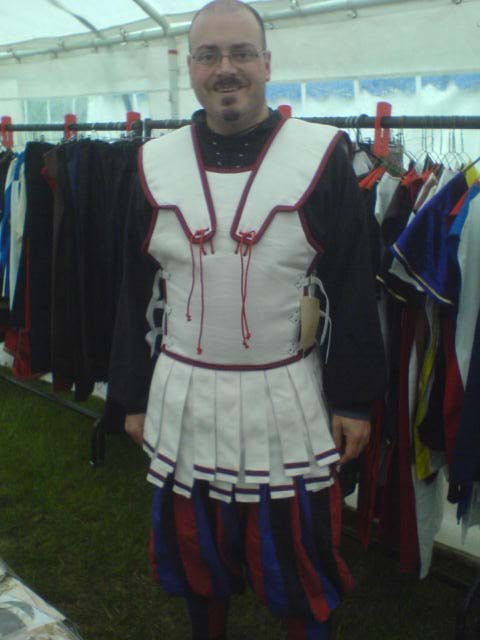 LRP armour based on the Hoplite Linothorax. It is made of a white quilted and padded linen torso, stiffened linen shoulders and an optional linen skirt. Contrasting coloured edging can be added at no extra cost. 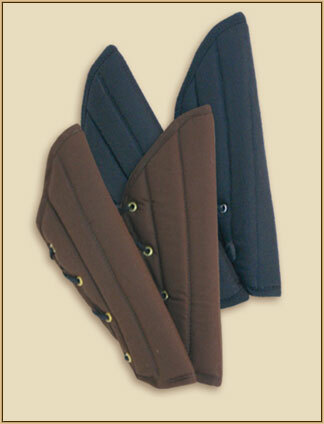 The matching sleeves to the padded vest "Arthur". In order to get the closest possible colour match it is advisable to buy the sleeves and body at the same time. 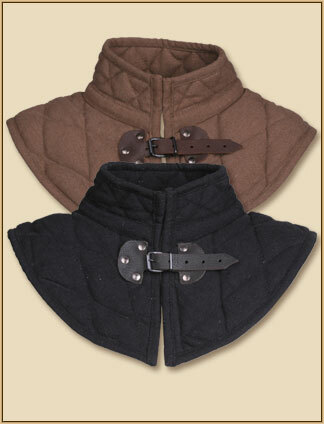 The matching tassets to the padded vest "Arthur". In order to get the closest possible colour match it is advisable to buy the tassets and body at the same time. 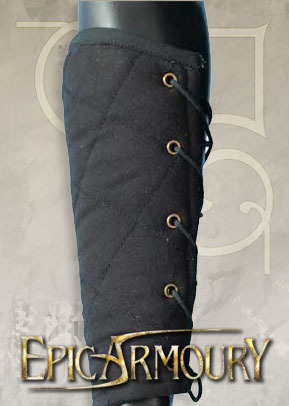 These are the matching greaves from the "Arthur" series. The greaves are backstiched in diamond-shapes and therefore very flexible when moving. The padding is secured by two buckle-straps. Please note the brown changes from batch to batch. 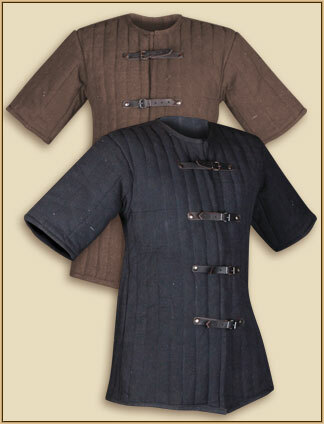 This Gambeson is backstiched in diamond-shape and closed by four buckle-straps in the front.The collar is backstiched in smaller diamonds: this brings more comfort to the neck area. Please note the brown changes from batch to batch. This is the matching padded coif from the "Arthur" series.The coif is available in three sizes and therefore fits most heads. Please note the brown changes from batch to batch. An excellent item for wearing under coifs or even as a less bulky alternative to a full gambeson for taking the weight of the armour on the shoulders. Please note the brown changes from batch to batch. 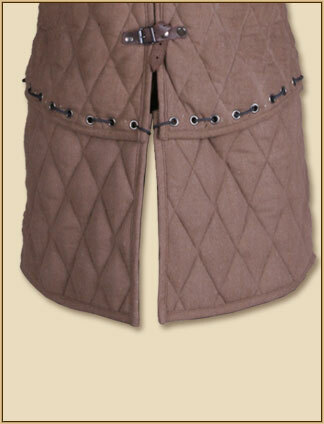 This top-stitched gambeson vest is an ideal add-on to be worn underneath many kinds of armour. The matching bracers from the Arthur series. The bracers are backstiched in diamond-shape and provide a maximum in movability without minimizing the effect of padding. They are closed with two buckles. Please note the brown changes from batch to batch. With 6 lacings in the front and his sidecuts it can easily be adjusted to the wearer. The long sleeves are closed with an additional lacing. 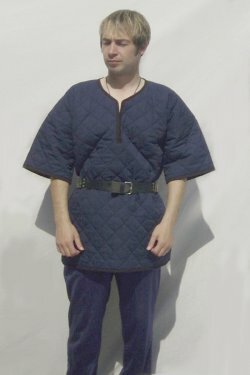 This Gambeson is a basic gambeson for beginners. 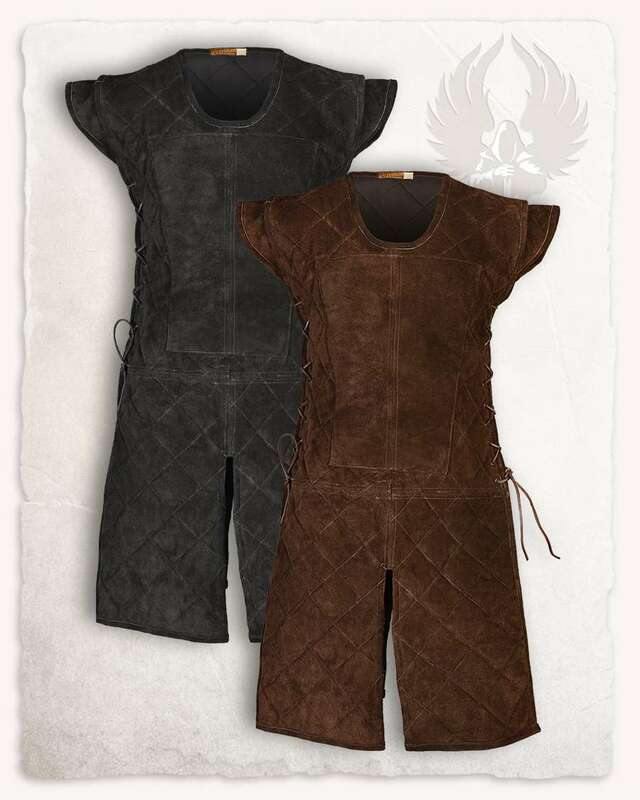 The Padding is light and gives a perfect protect and fit for light Armour and chainmail. 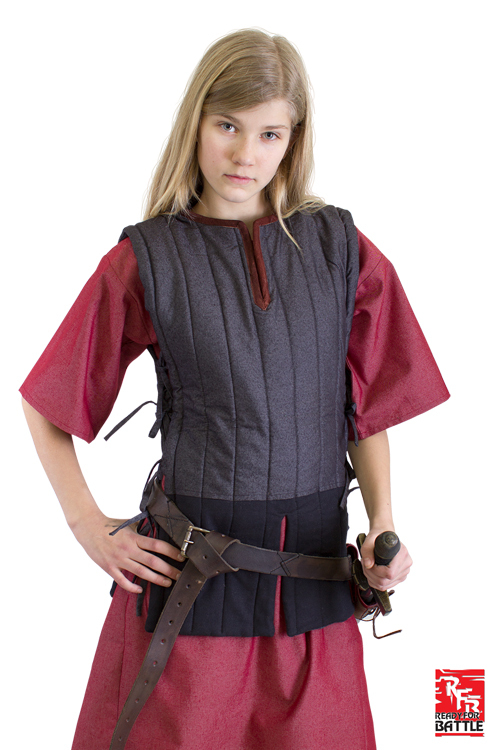 A simple shortsleeved gambeson at a great price. It has a linear backstitching and it can be closed with four buckles in the front. A good padding to be worn underneath chainmail or torsoplates. 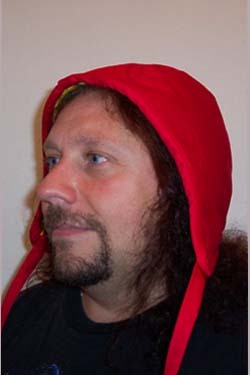 Reversible cotton hood made in the same style as the gambesons. Studded version costs an extra £7(Be careful if you have long hair with this option!). Buckle fastenings are available for an extra £3. 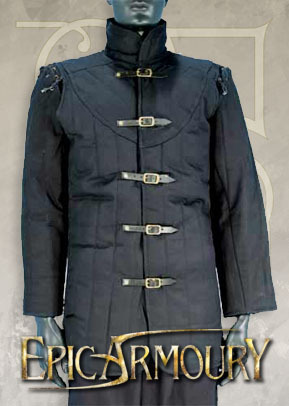 This Epic Armoury Imperial Gambeson is a padded long-sleeve coat covering the torso from neck, down over the hips on front and back. 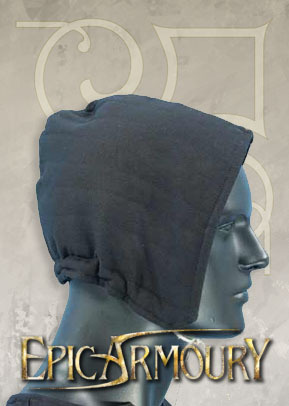 It can be worn on its own or serve as essential padding under mail or armour. 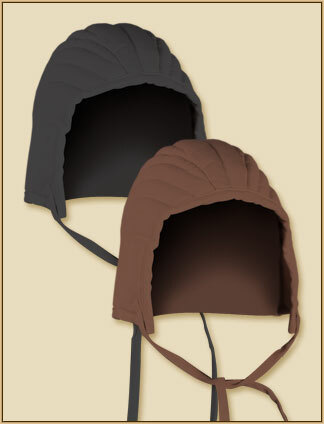 The padded coif is, just like the gugel, a classic medieval piece of clothing.A padded coif provides a better wearing comfort and allows you to wear maille-coifs and helmets for a longer time. 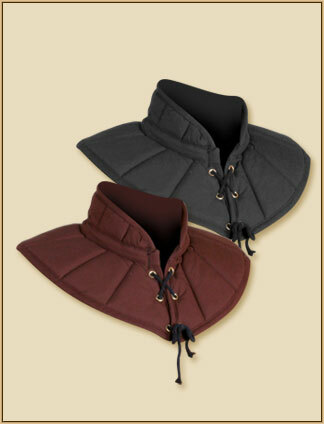 A padded collar provides comfort when worn underneath a gorget or spaulders.In addition to that it can be worn in combination with any kind of shirt and increases the value of these costumes. These padded greaves provide comfort! Worn underneath steel greaves your armour will be way more comfortable.The greaves are closed by leather strings on your calf. 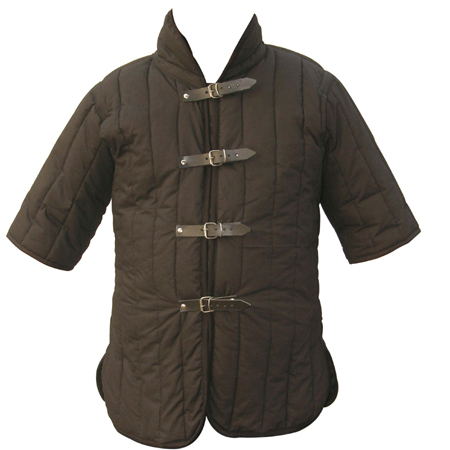 This is the classic gambeson of the medieval period. This variation has short sleeves which are fixed to the torso. The straight cut is being underlined by the "turtleneck" collar. This thigh protection was made for comfort reasons. It allows full leg guards to be worn for a longer period of time.They are attached with a seperate belt on your hip (belt not included). 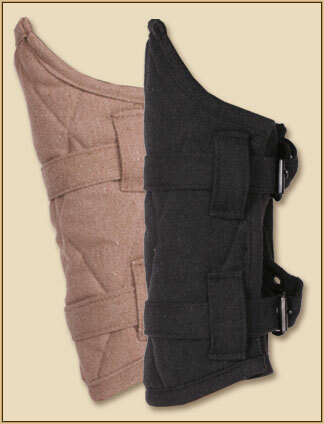 These padded bracers provide comfort! Worn underneath steel bracers your armour will be way more comfortable. 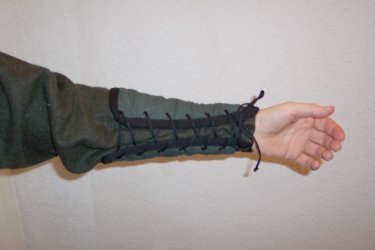 The bracers are closed by leather strings on your forearm. The "Shapur" series shows a rather oriental cut. It is closed with three leather strings in the front and has the two flaps overlapping. 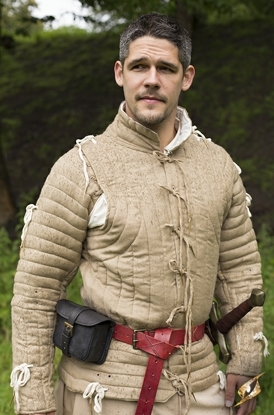 Women may like this gambeson as it is fitted on the waist. 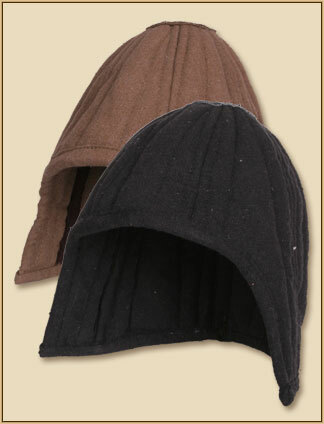 Padded arming cap to wear under a helmet. 100% cotton twill on outside and indside, and polyester padding . 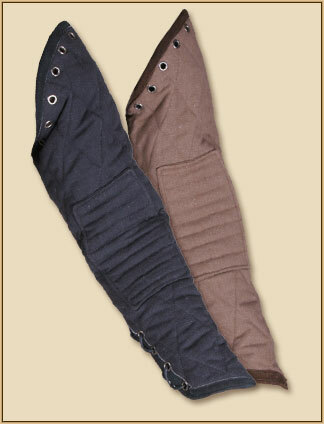 Padded leg protection to wear under metal or leather armour. 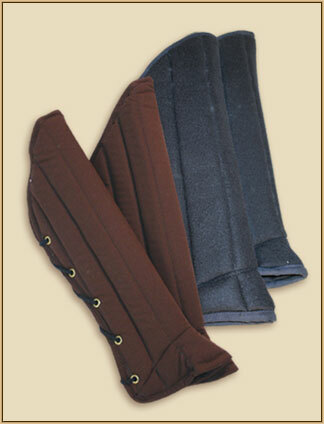 Padded arm protection to wear under metal or leather armour.